Dirtybirds unite! It’s our favorite time of year – time to light up the grills and turn up the speakers, as the Dirtybird BBQ series is in full effect. Once a small gathering among friends in San Francisco’s Golden Gate Park, the Dirtybird players now give fans across the country an opportunity to dance, eat, and goof around with some of the world’s best DJs. For those, like myself, who are avid Dirtybird fans, the concept of the Dirtybird BBQ is nothing new – and we all know it’s a must-attend event. Washington DC already popped off last weekend and as I’m writing this article Las Vegas is just getting started. We here in San Francisco are spoiled because we quite literally live in the home of Dirtybird, where it all started, and where it still thrives today. Justin Martin, Ardalan, and Worthy reside in the Bay and we’re often treated to sets around the city by any number of Dirtybird players and friends. And you can’t forget the regular Dirtybird Quarterlies that are absolutely amazing parties. 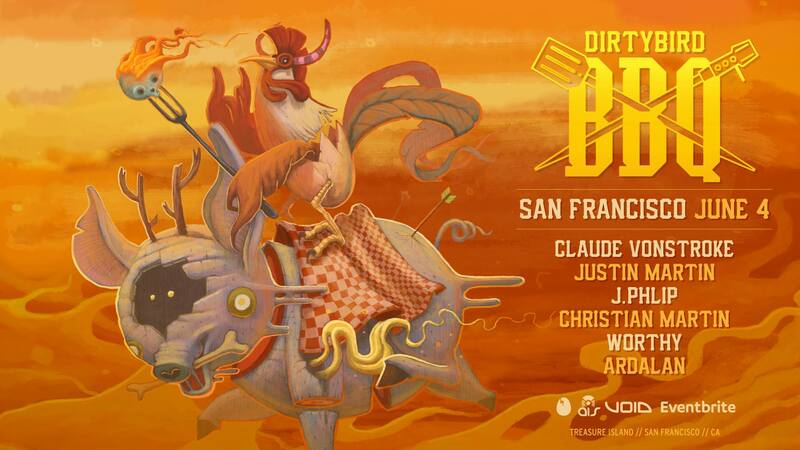 In just two weeks the Dirtybird BBQ returns to San Francisco’s Treasure Island – a picturesque location to host a day party, with breath-taking views of the San Francisco skyline and beyond. While all Dirtybird fans know how to get down, there’s something special about the Bay Area crew and the vibe of a homecoming show with some of the best DJs you’ll ever hear – Dirtybird or not. If you’ve already been, then this is routine for you at this point. And if you’re on the fence about going, there’s no need for you to hesitate. See y’all there!